Students in an Applied Problem Solving class focused on the university's climate action efforts. Not every course allows students to influence the future of their campus. During the fall semester, a group of NC State students in a unique applied problem solving course learned about the university’s climate efforts and developed recommendations for future work. 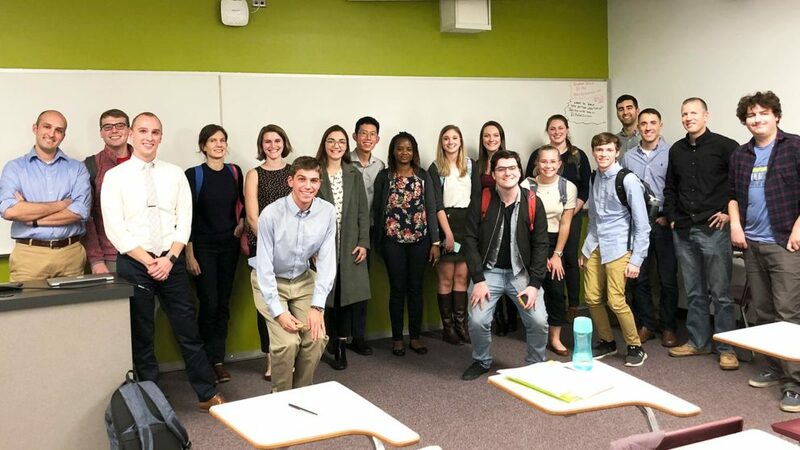 “This class was a great way to see how big, complex conversations around a global problem like climate change play out in the very real, very tangible context of our literal backyard,” said associate professor Christopher Galik, who taught the course. The Department of Public Administration offered the interdisciplinary course, which included 19 undergraduate and graduate students from three different academic colleges. “Taking this class I have learned how to mesh together ideas from many different disciplines to find solutions to problems that don’t have easy answers,” said Daniel Spruill, a master’s student studying Climate Change and Society. Galik created the course in partnership with the University Sustainability Office, which manages NC State’s Climate Action Plan. The plan was developed in 2010 after the university committed to climate neutrality by 2050. Throughout the semester, students heard from campus experts about climate mitigation efforts. At the end of the course, students divided into groups to make recommendations for future work, such as how to encourage energy conservation and which campus buildings have potential for rooftop solar energy. The experience working with real-world parameters was also excellent career preparation, according to Lydia Campbell, a master’s student studying Climate Change and Society. Published in climate, News, Newswire, Students.